I love this recipe for a few reasons. It is simple, yummy, and balanced. Even though I work at home, I do not always have or take the time to make a well-balanced breakfast. 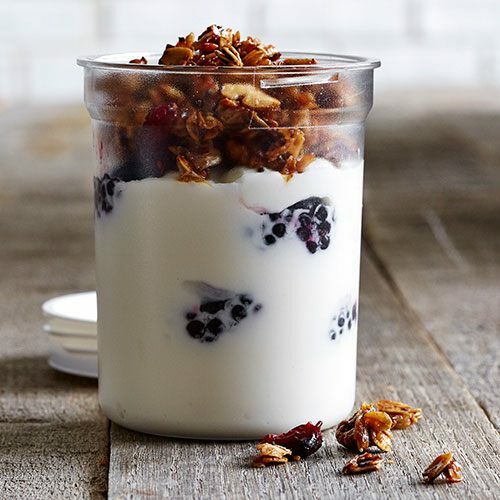 What I love is that in just a few minutes I can grab some of the granola I premade, some berries out of the refrigerator and some Greek Yogurt and I have a great breakfast filled with protein and fiber, I can eat while I am working and sipping my morning cup of coffee. The other thing I like about this is that with the Make and Take Snack Jar I have portion control at breakfast, which is one of those skills I need to work on in my life. I also have a balance of protein and fiber and I do not need to worry about what is really in my granola a I made it myself.